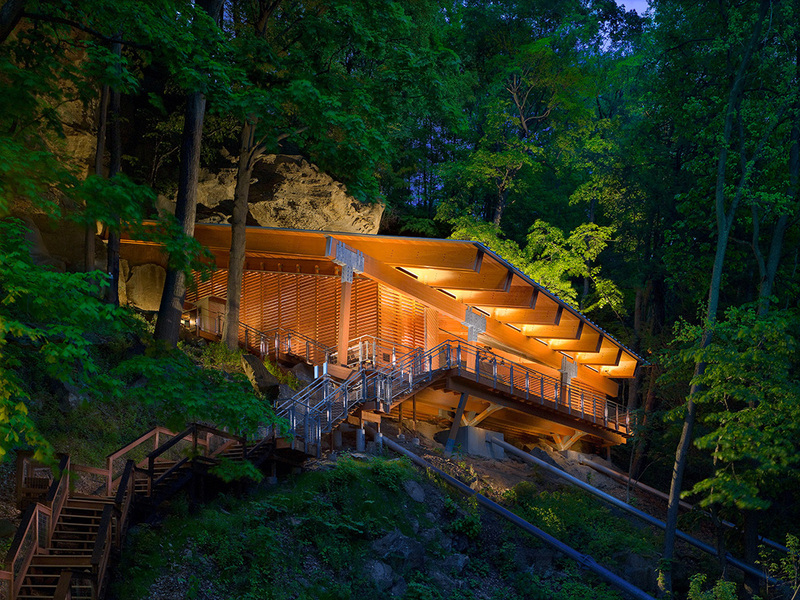 The Meadowcroft Rockshelter is a National Historic Landmark and a remarkable archaeological site which documents the presence of prehistoric people in Western Pennsylvania for at least the last 19,000 years. Meadowcroft Rockshelter at dusk. Photo by Ed Massery. The archaeological excavation uncovered 1.4 million plant remains including material such as pollen, seeds, and nut hulls. This material not only provides information about what was growing here over the past 19,000 years but, in some cases, provides information about what the people who used the site were eating. Inside of the Meadowcroft Rockshelter. The Rockshelter is an impressive geological feature. The Morgantown-Connellsville sandstone was undercut by the waters of Cross Creek over tens of thousands of years. This resulted in the large overhang which provided shelter for prehistoric people and made a great place to camp. In the center of the site lies the partially excavated remains of a firepit which dates to the end of the last ice age. While the glaciers never got any closer to Meadowcroft than 50 miles to the north, by the time people arrived at Meadowcroft 19,000 years ago, the glacial front had already retreated north beyond the present-day border between Pennsylvania and New York. Against the rock wall at the back of the site is the spot where, on Nov. 12, 1955, Meadowcroft discoverer Albert Miller found artifacts excavated by a groundhog. As an amateur archaeologist, Miller knew his discovery should be excavated professionally, so he spent the next 18 years trying to find a professional who was interested. In 1973, Dr. James Adovasio of the University of Pittsburgh conducted the first field school excavation. By 1974, everyone knew this site was something very special. The number one feature of the Meadowcroft Rockshelter is (drumroll again …) the feeling you get when you look down at Cross Creek and realize that 19,000 years ago, some of the very first people to enter the North American continent were standing at this very same spot! And just a few feet away from you, underneath the same rock overhang you’re standing under, the evidence of their visits is still here. Dr. James Adovasio explains the site to a group of visitors. The large rock behind him is a roof collapse which took place 12,000 years ago. A close-up showing evidence of ancient campfires built at the site. The heat of the fire altered the sandstone particles to the red color. Also evident are bits of charcoal produced in the fires. 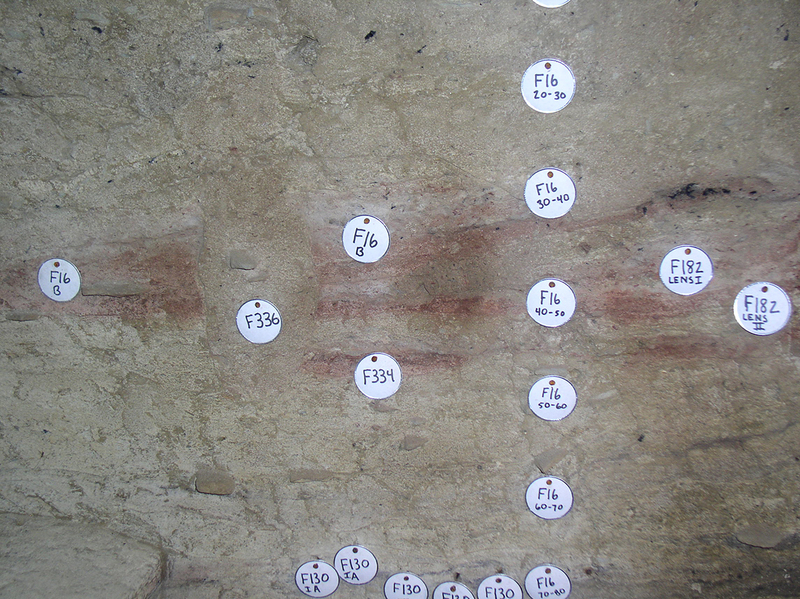 Tag F336 indicates where a post hole was dug down through the existing fire pit at a later date. 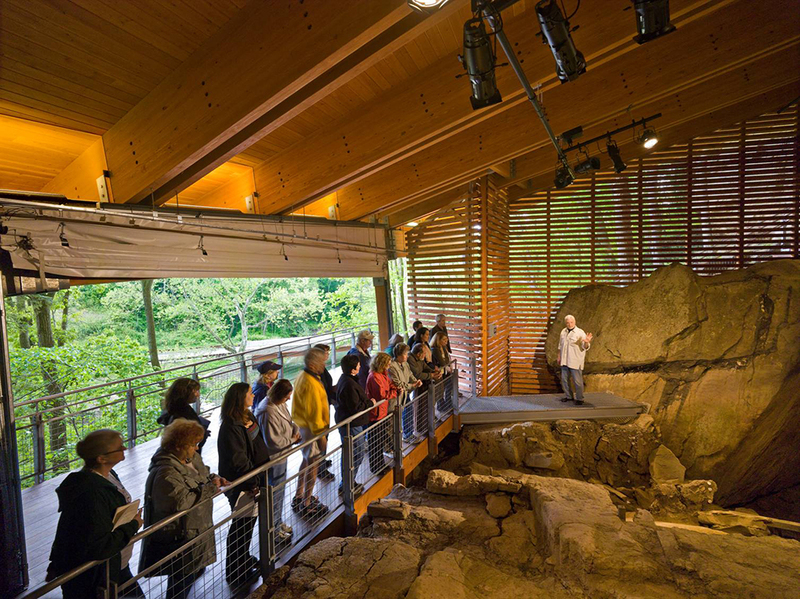 Explore the Rockshelter for yourself during an Insider Tour hosted by James M. Adovasio, Ph.D., who achieved international acclaim with his archeological excavation of the Rockshelter in 1973. Dr. Adovasio will present a lecture and lead a special tour of the site on Sunday, Oct. 14 at 1 p.m. and Saturday, Nov. 3 at 10 a.m. Please register online. 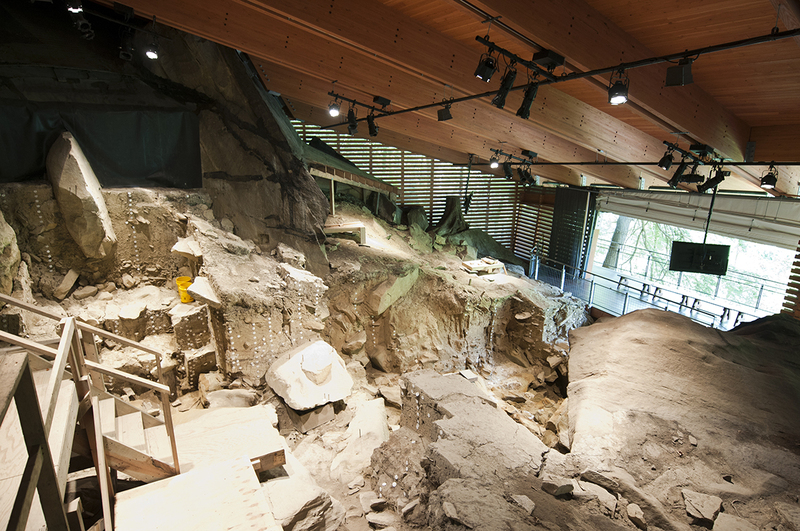 You can also explore the Rockshelter through the First Peoples Archaeology project and a gigapan of the Meadowcroft Rockshelter.